Gain insights into labour market demand. 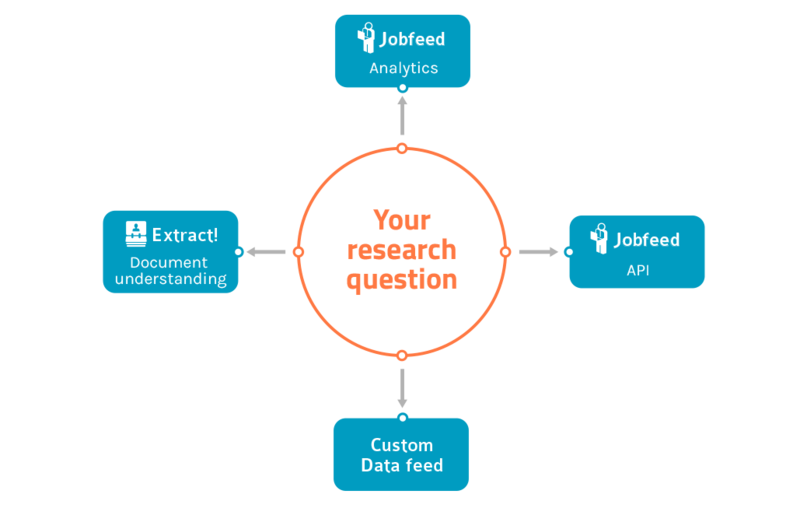 Support your analyses and reports with real-time and historic job market data provided by Jobfeed, the Big Data labour market tool from Textkernel. The combination of a rich data model and our ability to historically mine the data for specific questions, gives you insights with much more detail than traditional research methods are able to offer. Textkernel’s parsing technology automatically analyses jobs and profiles, and enriches and normalises the data to current standards for reporting. Textkernel has built a unique multilingual taxonomy of professions, skills, industries and qualifications that can be linked to standards like Esco or Onet. Imagine being able to understand and analyse all the explicit and implicit information for all online jobs. Jobfeed is a Big Data analysis tool offering you insights into current and past trends on any topic you would like to research.